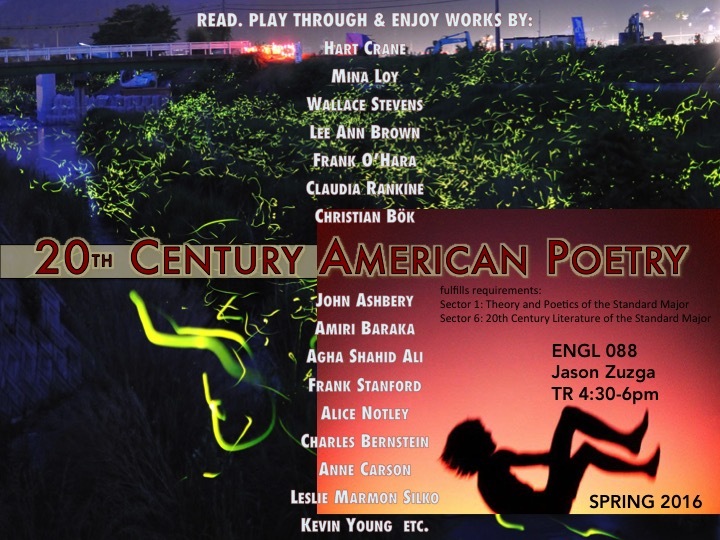 This fast-paced course will provide an immersion in a diverse and exuberant array of American poetry. We will consider the poem as an artwork made out of words, and specifically, in this case, words of the English language, asking, immediately, "how does a poem work?" as well as, more broadly, "what does it mean to make art out of English?" and "what are the stakes of a poem for various 20th-century United States citizens?" We will consider individual poems through careful, close readings, but we will also put poems into context, considering the poem in relation to historical events and the surrounding media such as 20th century painting, cinema, television and the internet. We will consider the poem as an object embedded in a rapidly changing world in which language matters in terms of identity and gender, commerce and desire. Who is speaking in the poem? Authors may include Emily Dickinson, Walt Whitman, Hart Crane, William Carlos Williams, Ronald Johnson, Lorine Niedecker, Jack Spicer, Rae Armantrout, Leslie Marmon Silko, Frank O'Hara, Langston Hughes, Agha Shahid Ali, Claudia Rankine, among many others, Above all, students will gain an understanding of central themes and issues in 20th-American poetry and will learn about the properties of language as an art-making medium. Both creative exercises and scholarly work will be required.